I love Christmas. It’s such a beautiful season, especially when you have children. As parents we have a pretty straightforward storyline for why we honor December 25. Jesus gave us the greatest gift of eternal life and we celebrate his birthday by “gifting” to others. If you’re a parent of young kids, you may find yourself sitting in the middle of a mound of toys that piled up over the last few weeks as a result of this season of generosity — but also of abundance. It’s hard to say no, especially during the holiday season (or birthdays for that matter). 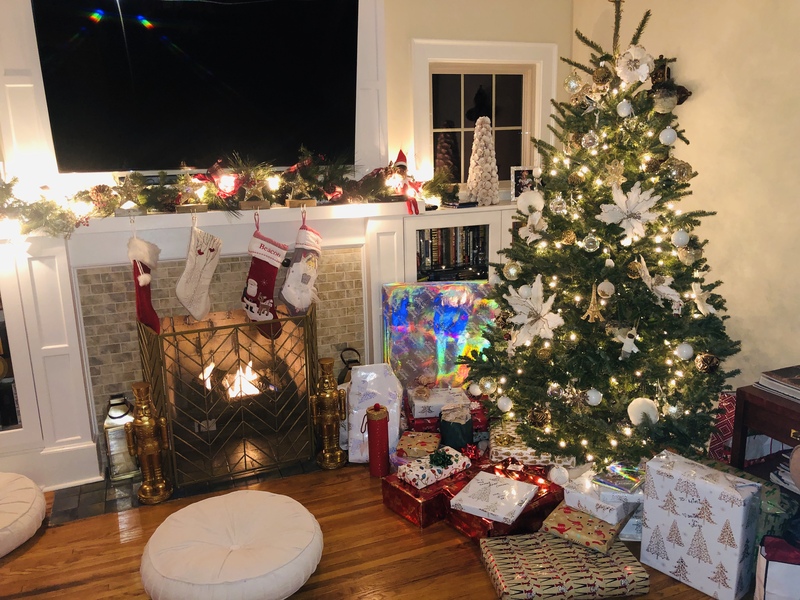 For parents, for grandparents, and even for friends, the lure of piling up dozens of gifts under the tree and watching a child’s emotions exude happiness upon tearing them open is far too tempting for adults to pass up. 1. No gift is ever satisfying enough to keep a child from rushing to the next wrapped present. 2. Toddlers are the epitome of selfishness. As my four-year-old Beacon searched under the tree he quickly tossed any of his sister’s gifts to the side to find ones with his name on them. As human beings we come into this world self-centered, and we have to fight that urge even into adulthood. As parents we must slow our children down. When we noticed Beacon doing this we quickly asked him to find some of Ora’s gifts and bring them to her so we could all watch her as she opened one at a time. 3. In a matter of minutes, the excitement is over. No matter if there's one present, or 20, it always comes to an end. "But it makes them so happy." Reality check -- No amount of toys, iPads, new shoes or fancy vacations will ever satisfy your child’s soul — or any adult’s soul for that matter. I think sometimes toys can be a crutch for parents who are driving themselves mad trying to keep their children busy. Activities fall in this category as well -- movie dates, soccer games, gymnastics, bowling, etc. I know from plenty of experience that my kids are much better behaved when we're out doing things. But the truth is that you can't keep your kids occupied 24/7 -- it's not healthy for them, or for you. And I don't think God ever intended us to do so. We should all know how to be content with no toys around and nothing to do. What if the real goal of parenting was NOT to keep our kids happy, but to help them reach their full potential as human beings? Even if it means saying no to a lot of their requests? Let’s make sure we don’t lose sight of that, even after a season of never-ending gifts. For my husband and I these days, that means saying "no" a lot more than we say yes. It means having our children work hard for weeks and sometimes months for something they desire (still working on this with toddlers!) Sometimes it means saying no to grandparents who want to buy countless gifts for every holiday (also working on this one!) And don't give me the old -- "It's a grandparents job to spoil their grandkids." Listen, that's okay to a certain extent. But guess who your spoiled kid comes home to? You. "I actually love seeing my children happy," she writes. "I don't set out to make them unhappy. But my husband and I are the authority in their lives. It's our job to place rules and guidelines in our home. It's also our job to follow through with the consequences when they are broken. One is a lot easier than the other. So unhappiness happens in our family nearly every day in some way." I feel like my home is a lot like that these days. But our children need to not only understand obedience, but realize that we do not live in a world that constantly gives you what you want. Our job as parents isn’t to say “yes” to all of their requests. I’m pretty sure that eventually creates a monster anyway -- Think Veruca Salt from Charlie and The Chocolate Factory. Now think of Veruca Salt as a grown woman. I can't imagine she'd be very happy. By constantly saying yes to your children you are robbing them of the valuable lessons we can learn from rejection.